This is known as blue and white ware, and unsurprisingly has a rich history and tradition in ceramics, which is why I feel so familiar with it despite never having done any research into the area. It is a process which seems to have originated in china, and dates back as early as the 14th century, but has now become adopted worldwide as a technique for decorating porcelain works, especially forms such as plates and vases. I am not sure if this is going to cause difficulties if I am trying to emulate classic blue and white ware, or alternatively if it would make no difference the style I draw it in precisely because there is no standard format. It is a phenomenon that I have noticed a lot in terms of art and creative areas, that a lot of people seem unable to see past the subject of the drawing, and not see whether it is technically good or bad. In this case, as long as it is a blue painted flower on a white porcelain surface, the rest seems to be largely irrelevant. 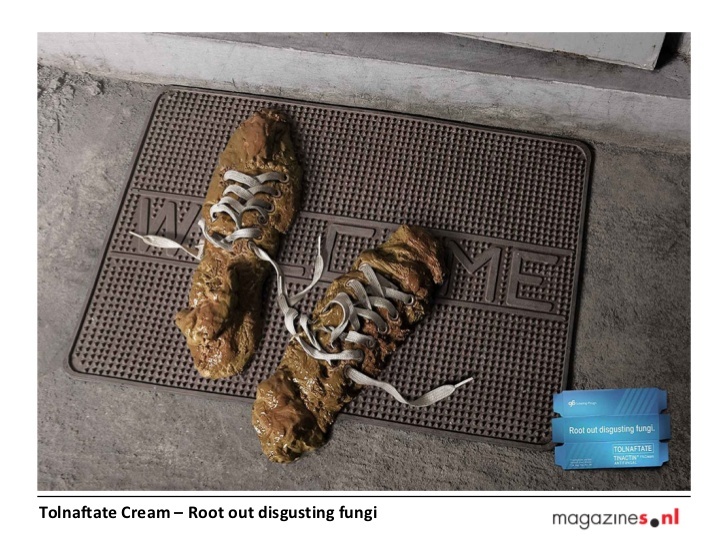 While this makes me uncomfortable, I can at least strive to meet my own standards even if they go unnoticed by others. The traditional way of creating blue and white ware is by painting the design using a cobalt oxide glaze onto the fired porcelain surface, and then painting over the body with a transparent glaze giving the piece its glossy finish, and this is also known as “underglaze blue”. However, my tutor tells me that the large amount of blue and white ware made in modern day (likely all of the pictures shown above) are created using ceramic decals or transfer printing. This allows for many detailed pieces to be produced in bulk, and has largely overtaken the traditional process of painting directly onto the piece. Unfortunately for me this takes away a lot of the appeal of the work, and is certainly not something I would like to use in my own piece. I am far more comfortable with the concept of painting directly onto the piece itself, than painting in say a sketchbook, scanning the piece, trying to make sure the image is perfectly sized and matches the size and shape of my work, sending off to get it printed onto ceramic decals (which are also very expensive), and then carefully transferring it onto the piece. 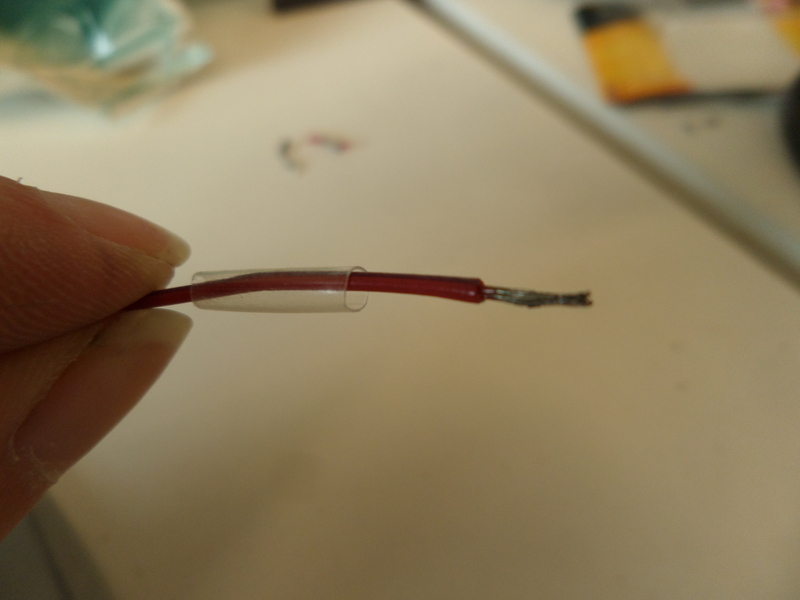 It seems much more complicated, time consuming, and expensive than simply painting onto the surface, and also doesn’t allow for much experimentation or trial and error. 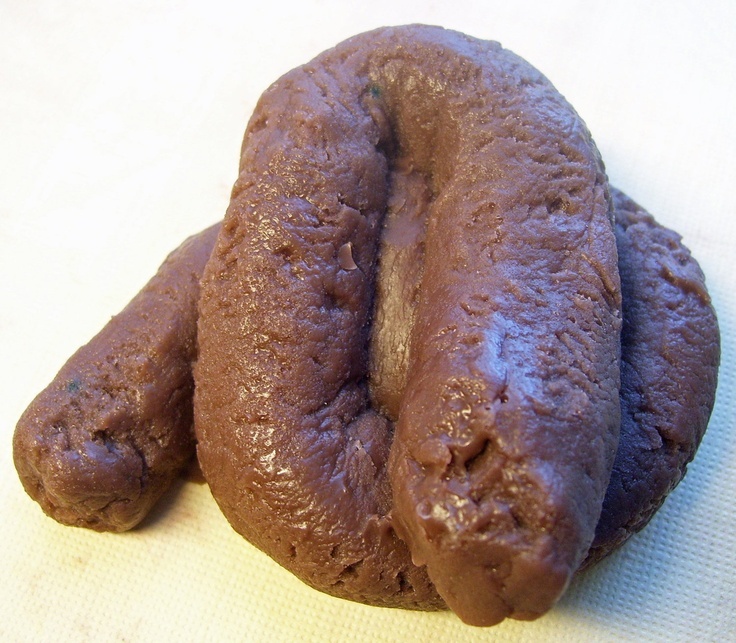 For example if I create a design, and it is not the right size/shape/resolution for what I have sculpted, I have then wasted £15-£20 on a decal sheet, roughly a week of my time on delivery, and have to do it all over again to send off for another one. 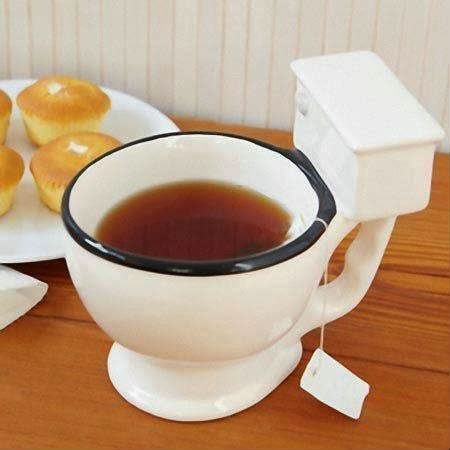 I can’t say that this is something that appeals to me. 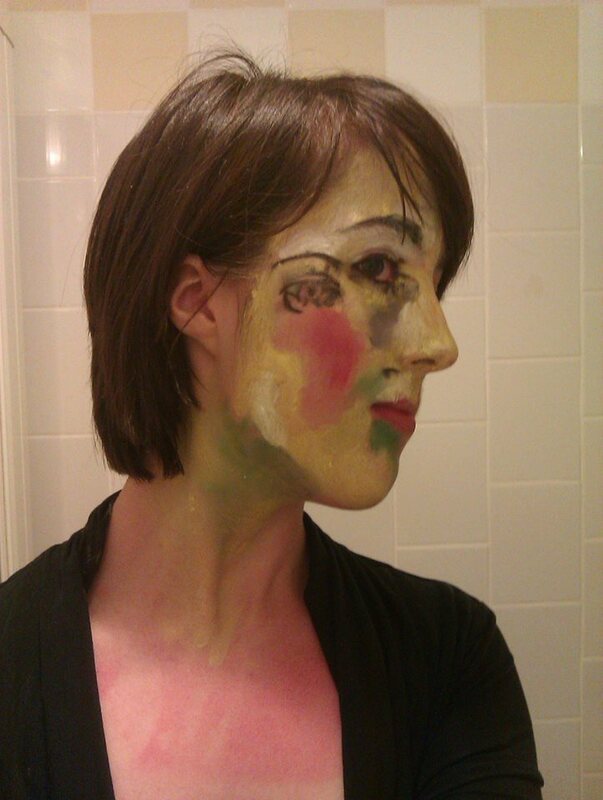 It seems far more intuitive and part of the creative process to be handling the piece, brush to the surface. Then if something goes wrong, the design is not as I want, it is simply a case of either cleaning it off or making another. If I do proceed with making blue and white ware this is certainly the method I will choose to pursue, but I would like to get my designs much more clear before I start experimenting with materials so that I have a goal to work towards while I am making. 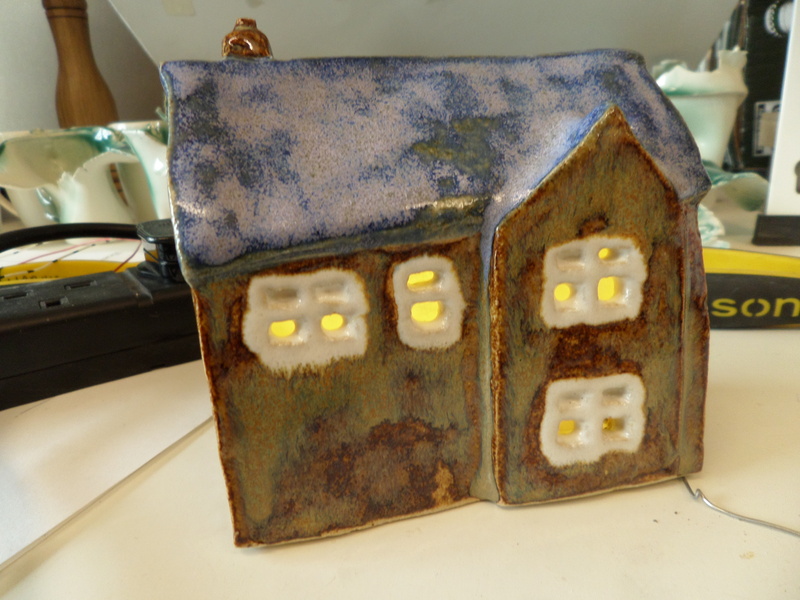 Now that I have most of my ceramic houses out the kiln, I can finally get to the matter of wiring them up with SEDNA lights. 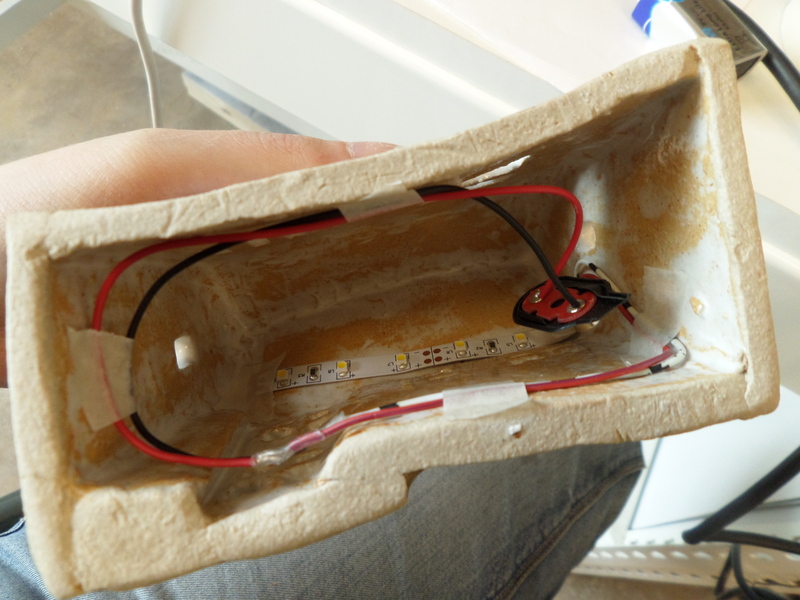 While I originally planned to use a series of sensors and arduino in order to change the strength of the lights, causing them to be brighter and flicker the closer that a person gets to the piece, I have not been able to implement this due to nobody being available to teach me the basics of arduino. I began with these basic components, and while this may be very simple to someone with any small degree of computing knowledge, for me this alone was extremely daunting. 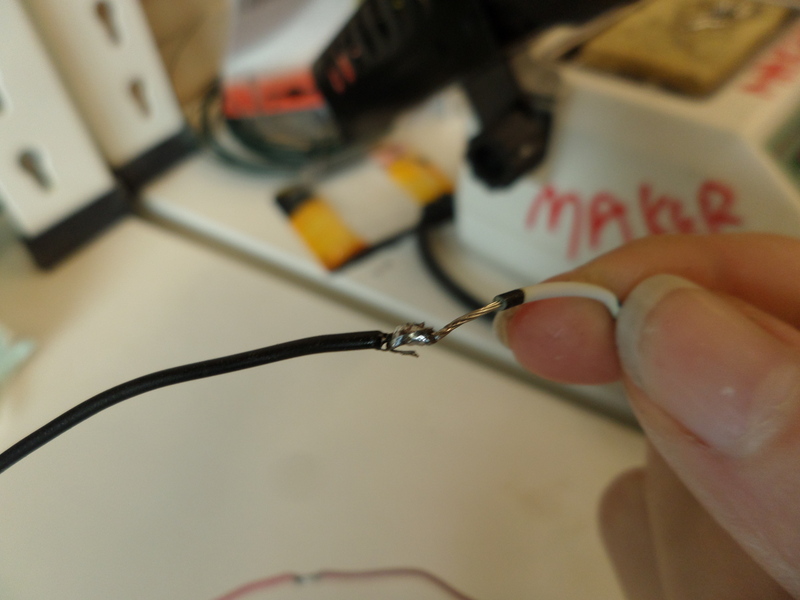 Thankfully I have had some experiencing with soldering in the past on a handful of occasions, and while I wouldn’t say that I am confident with soldering I was able to manage on my own. 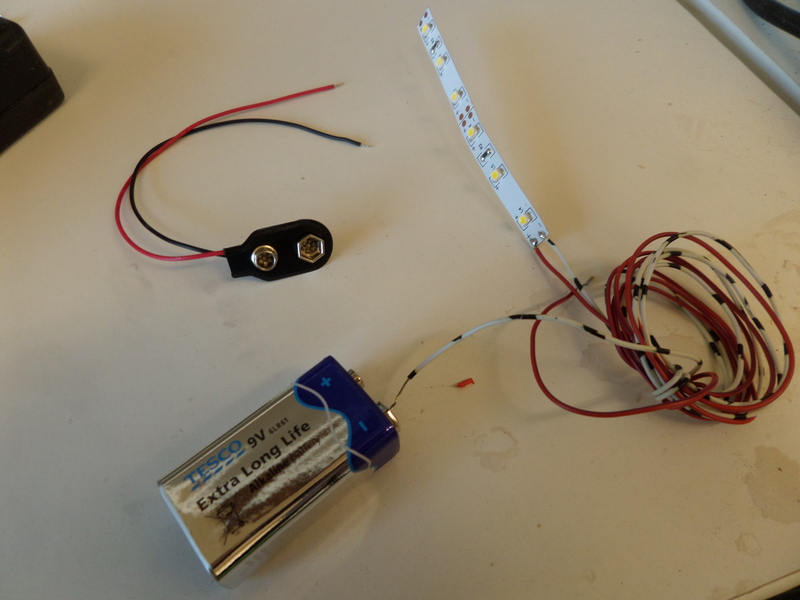 This involved soldering the positive red wires together, and the negative black or white and black striped wires together to complete a circuit between the LEDs and the battery clip. 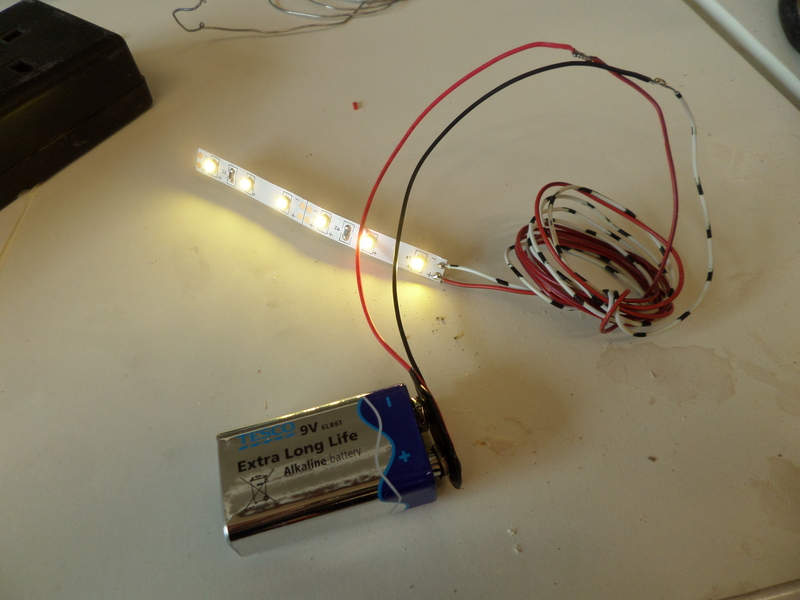 Once the wires are connected up, I could then attach the battery clip onto the 9V battery which lit up the lights! This was extremely exciting to me, even if it is only a small feat, it felt like a real achievement for me. With the lights inside, I must say I find these buildings even more appealing. The pieces themselves are quaint and I feel that they would sell very well, especially in a craft setting. With the lights, not only are they decorative they also have a novel and functional quality, which allows it to appeal to a market outside the art world. 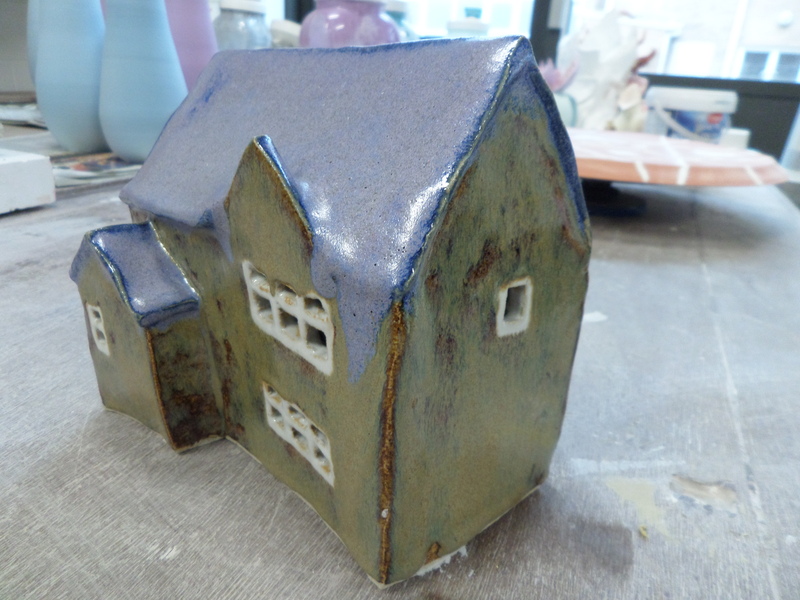 While I was hoping to use my first house as a test, which I could then use to decide whether or not to use the same series of glaze on my other pieces, I ran into some complications along the way. 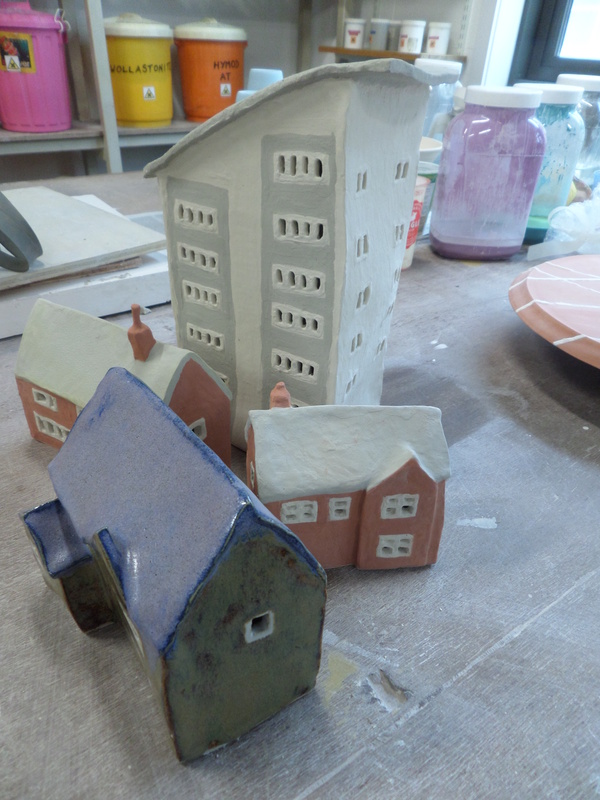 I had expected my glazed building to come out of the kiln at the beginning of the week, giving me enough time to glaze the others and get them fired before my submission date. 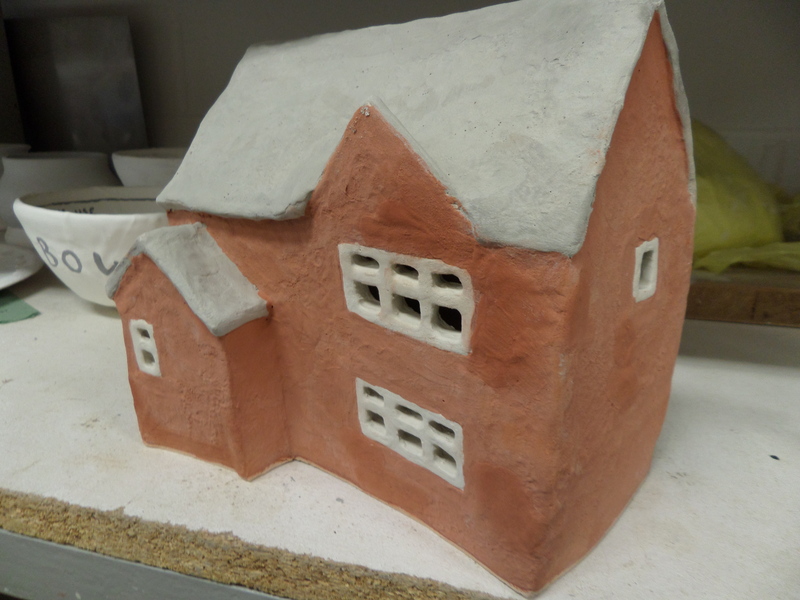 However it turns out the kiln did not get up to the temperature it needed to, and so it needed to be fired a second time. 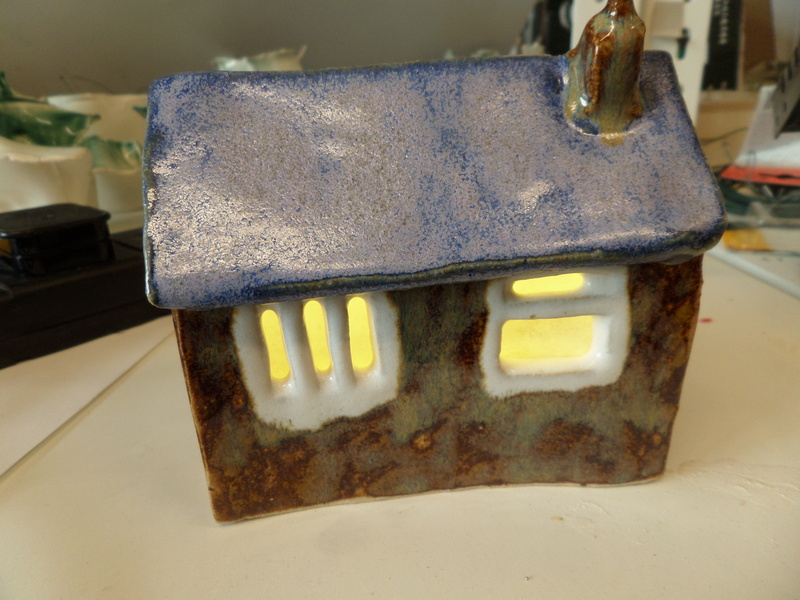 This meant that in order to have enough time to get my other pieces fired, I would not be able to wait around to see the results of my first house, and had to go ahead on blind faith and glaze them all. 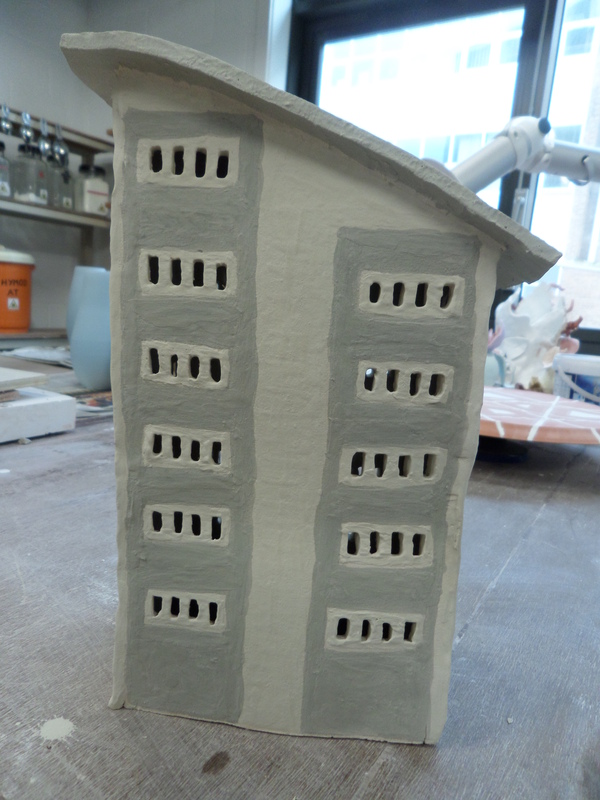 Thankfully, after seeing my first building eventually come out of the kiln I was pleased to find there were no major problems with it. While the colours weren’t quite what I expected them to be, they grew on me nonetheless and I think they certainly don’t seem out of place on the house. This is reassuring to me that the others will at least turn out of the same standard. 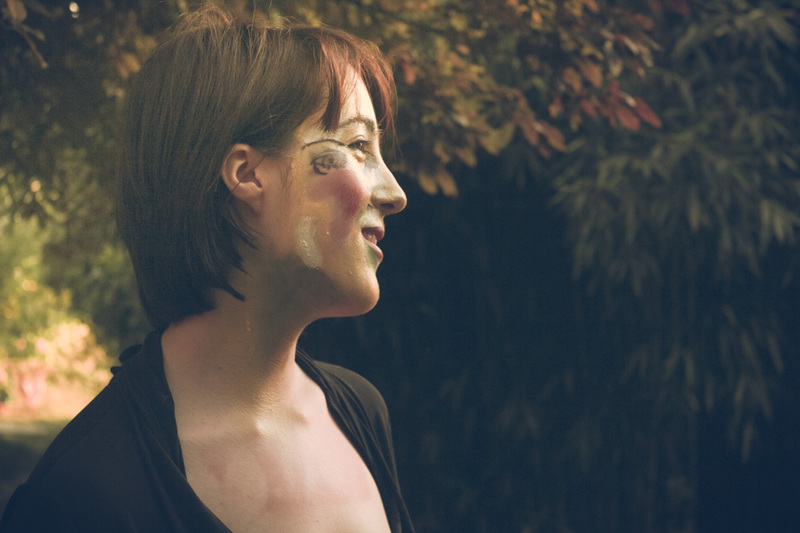 What struck me most, and initially displeased me was the way in which the glaze has run, with it dripping from the roof and melting down the sides of the house, after I had spent so much time painting them on in a very precise manner. However, after taking some time to look at it objectively, I think this does in fact play on it’s charm, looking almost as if it has been caught in the rain. 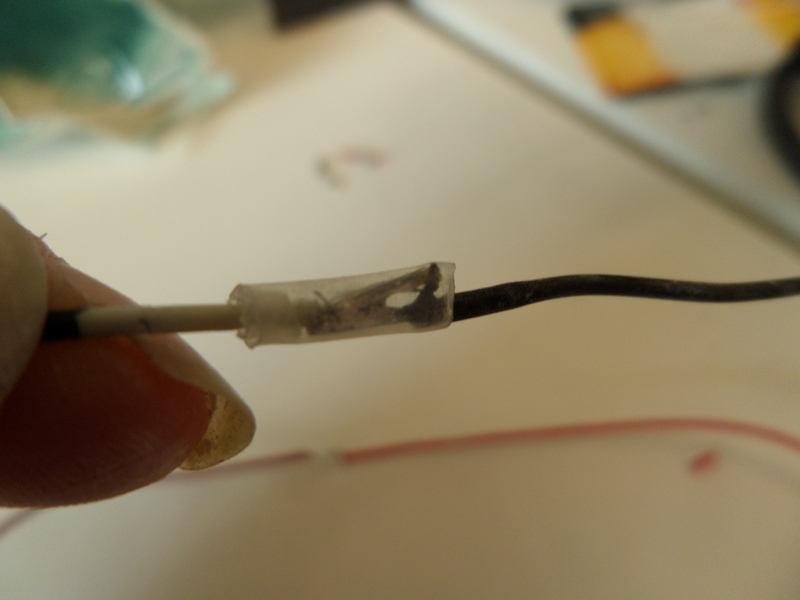 While I very much enjoy sculpting and using clay, when it comes to glazing it has to be said that I know very little. 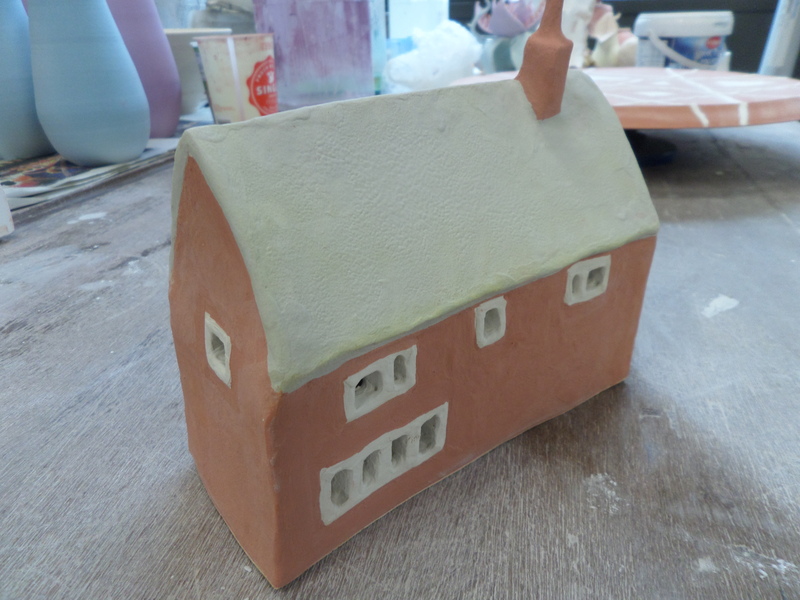 Up until this point whenever I have completed a ceramic piece, it has either been left unglazed or I have used glazes that I have been provided. Once again this lack of experience has limited my options in terms of finishing my work, and with there being very little time left before submission I do not have the time to go about researching glazes and then making my own. 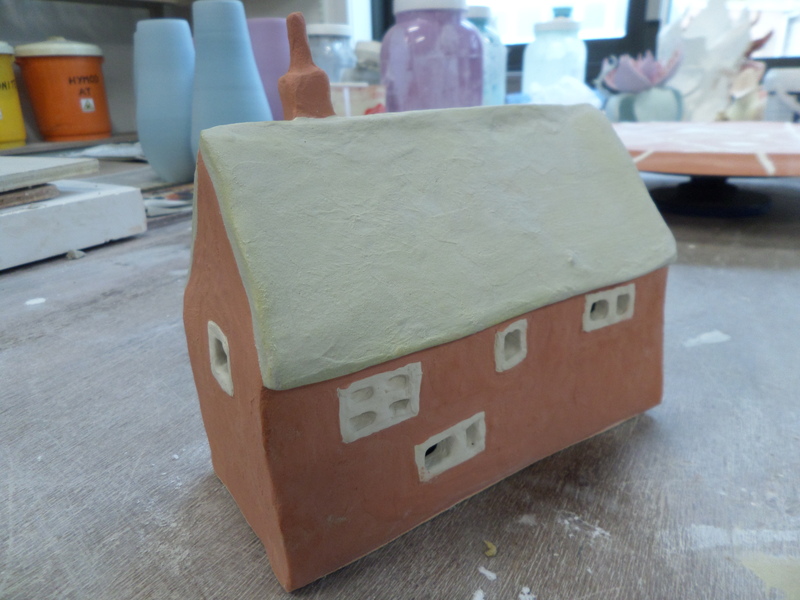 Thankfully the ceramics technician already had several premixed glazes, which although weren’t what I had in mind, did suit my purposes and had a colour scheme that I could use. 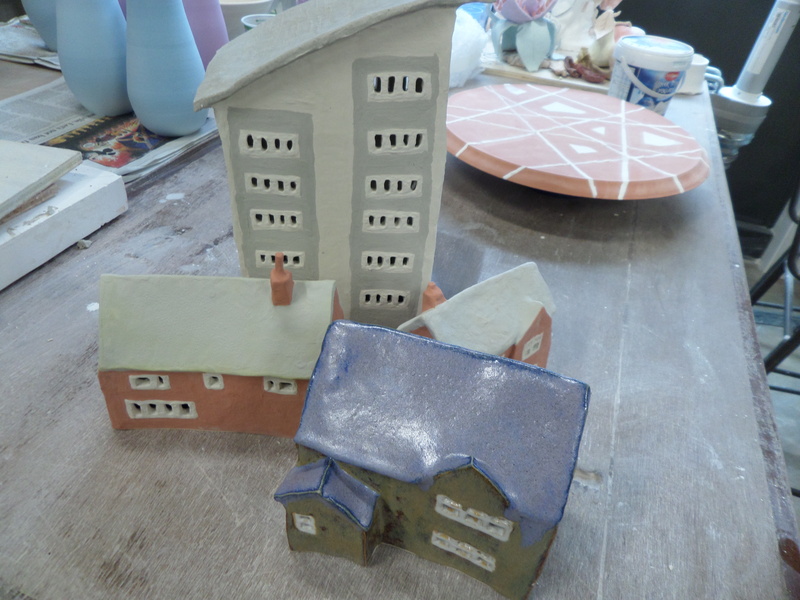 While this limited choice of glazes isn’t ideal, it is not a problem for me to have a restricted pallet, as I originally only planned to have a small set of colours that I would use across all the buildings so as to have a uniform aesthetic. 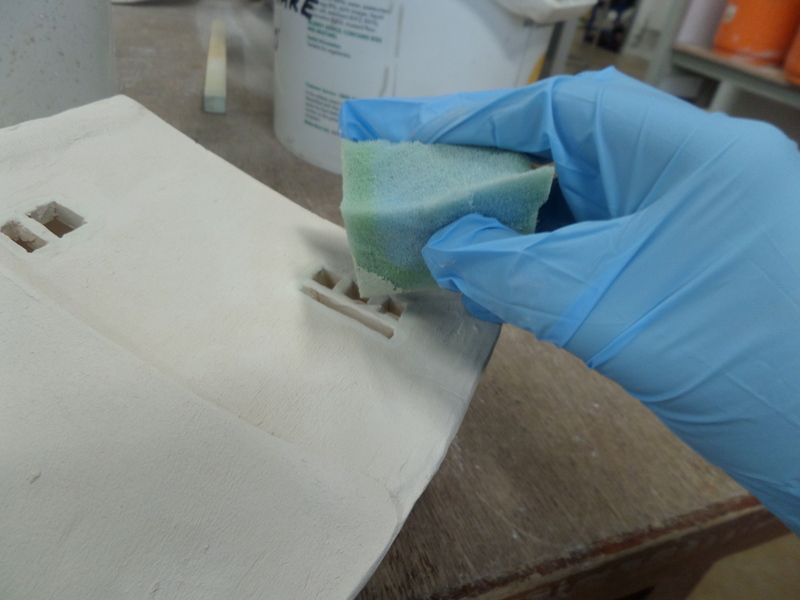 Applying the glaze involved first mixing them so that they were even without the sediment having settled on the bottom, and then applying 3-4 coats onto the ceramic surface. 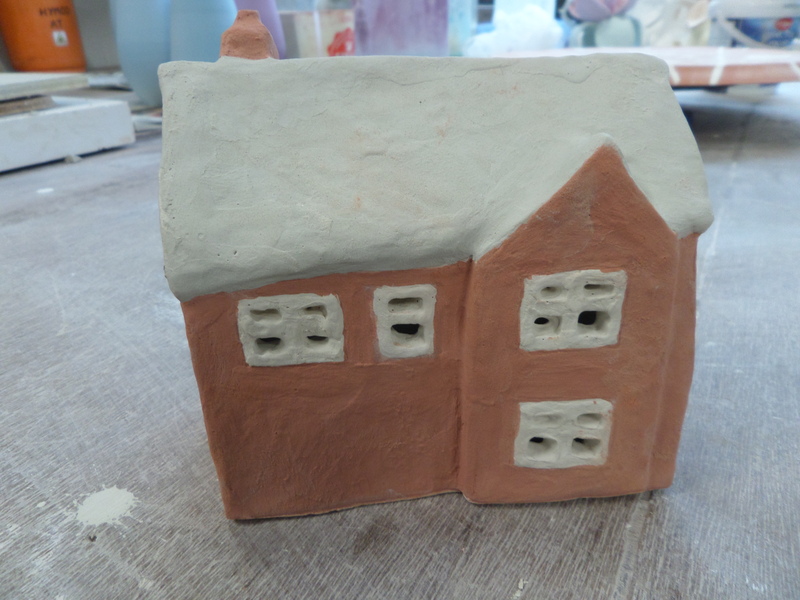 I was told to begin with the lightest colours first, so I started with carefully painting the window frames (outside and inside) as well as giving the inside several coatings of white glaze. 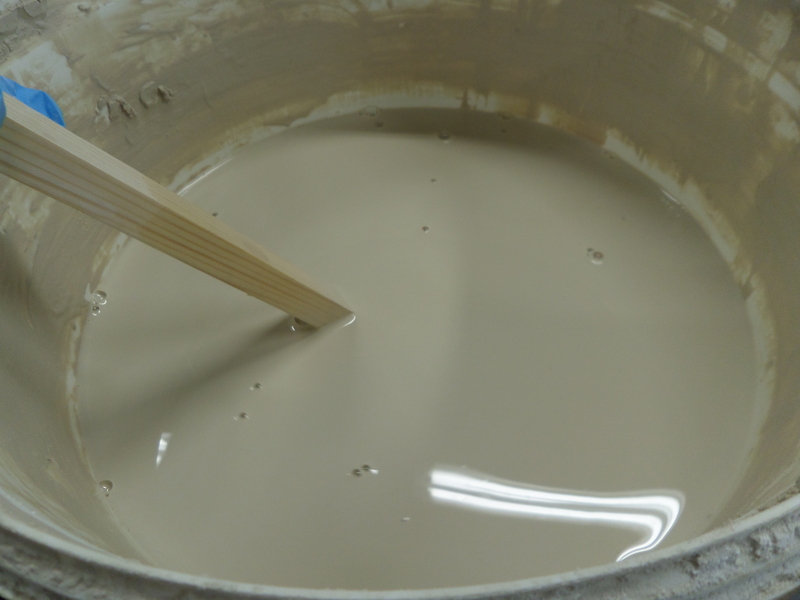 While the inside will not be visible, it is important to apply glaze on the inside of a surface when possible so as not to cause uneven tension between the outside and inside of a vessel which can result in cracks. 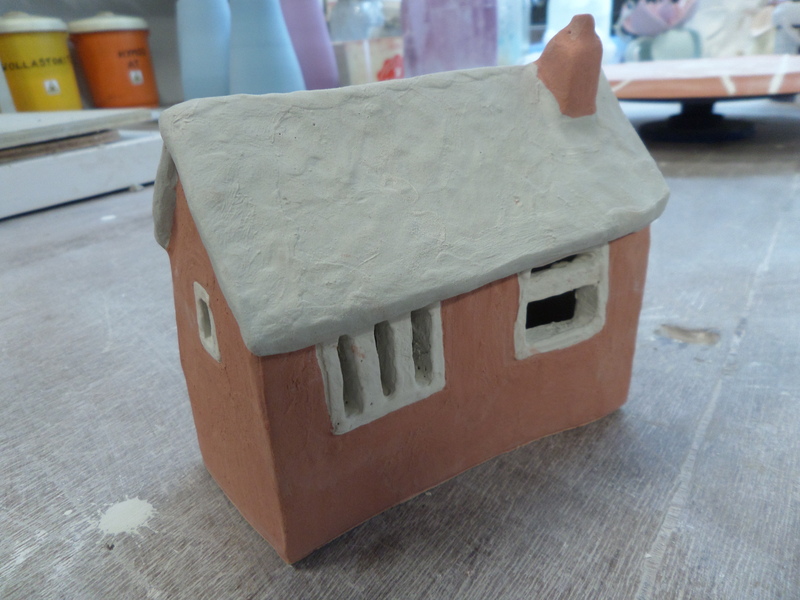 After this I then sponged on the red glaze onto the main body of the house, and the blue onto the roof, painting the glaze on with a paint brush in the smaller areas. 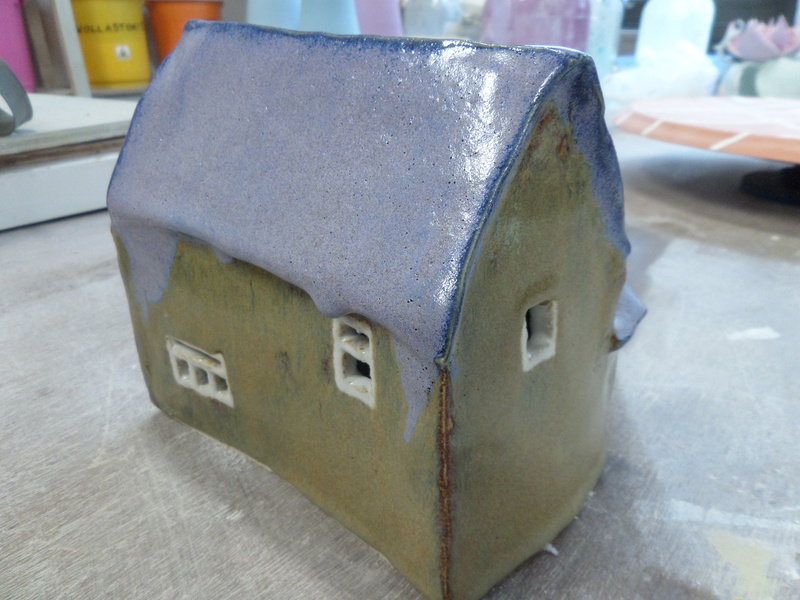 The reason I am only glazing this house is that I intend to use it as a test, so that I can see whether or not I like the effect of the glaze and whether or not it comes out the kiln in a good state. 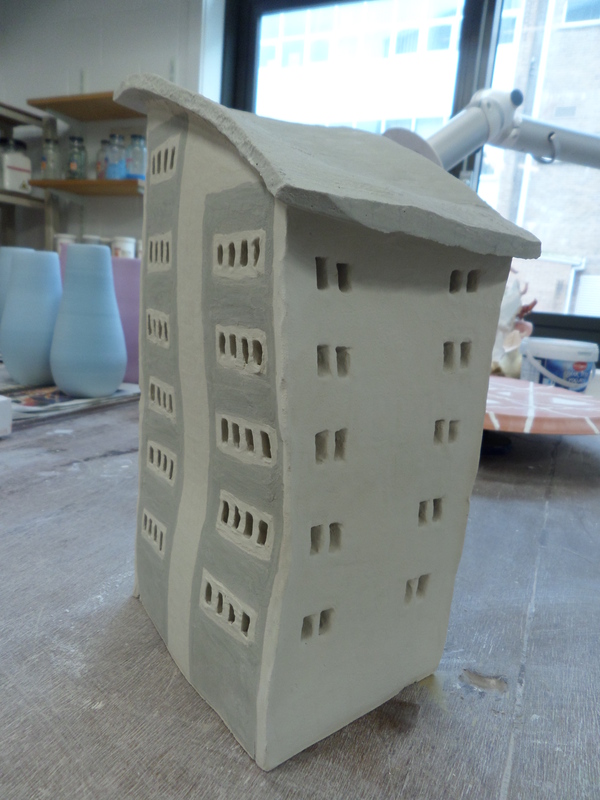 As well as this, the largest building is still yet to be bisque fired, as I am having difficulty getting it into a kiln due to it being so large, and so it would not be possible to fire all my pieces together at this point anyway. 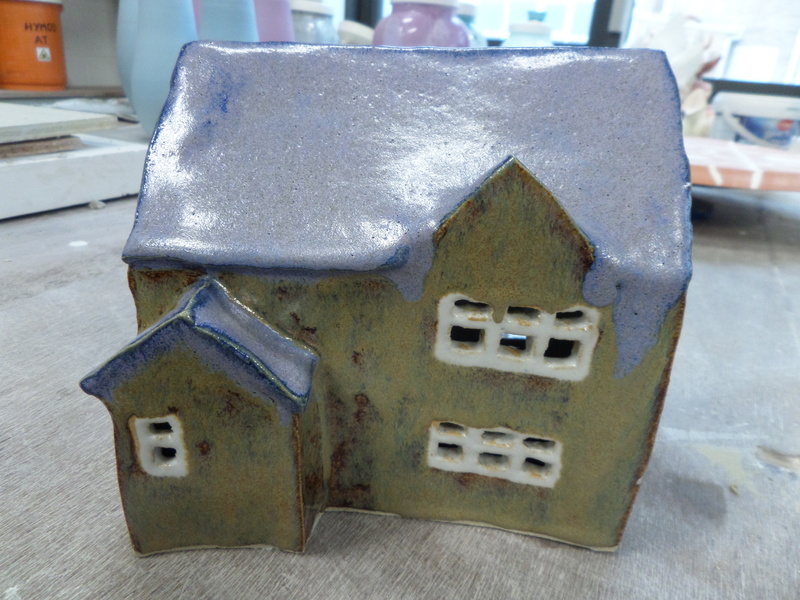 While I don’t have much choice in terms of glazes, as I previously mentioned, if the glaze turns out disastrously or causes my building to break in the kiln, then I will have no choice but to find an alternative. 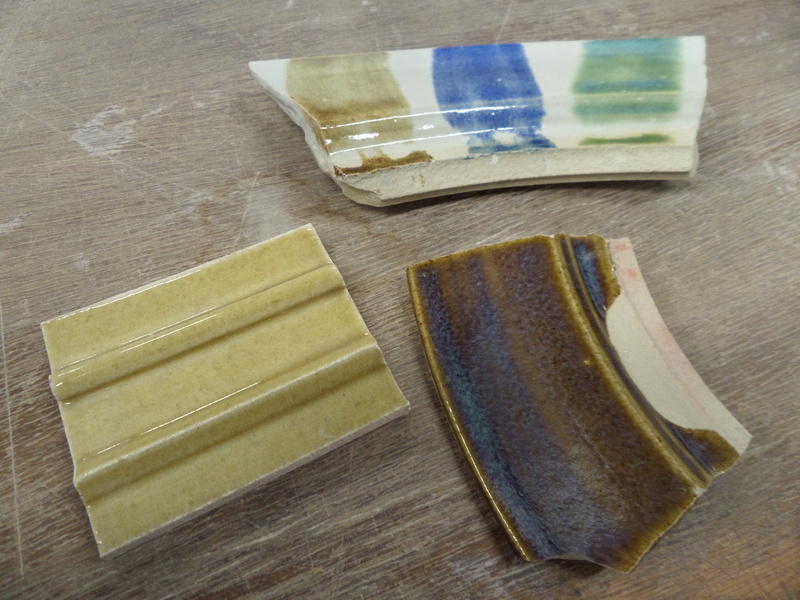 While this should not be the case, as I have seen samples of the glaze when fired, as well as being reassured by the ceramics technician, there is no harm in being careful. 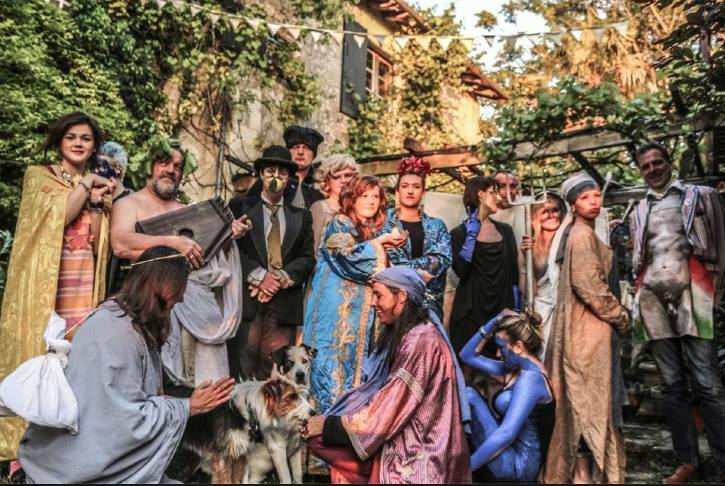 This year a few of us Makers got a chance to squeeze onto a Ceramics trip to La Perdrix in France after a few ceramicists dropped out. Having been last year and had a great time I jumped at the chance to go again. We were given two briefs for the week. 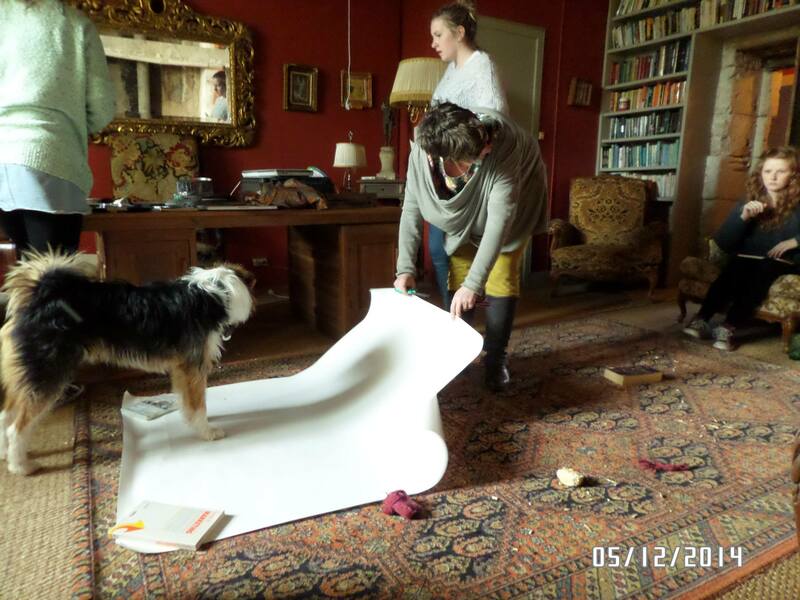 The first brief being a reasonably straight forward one of making a ceramic gargoyle of our own face, which will then later be fired and hung in in La Perdrix with water spurting out it. 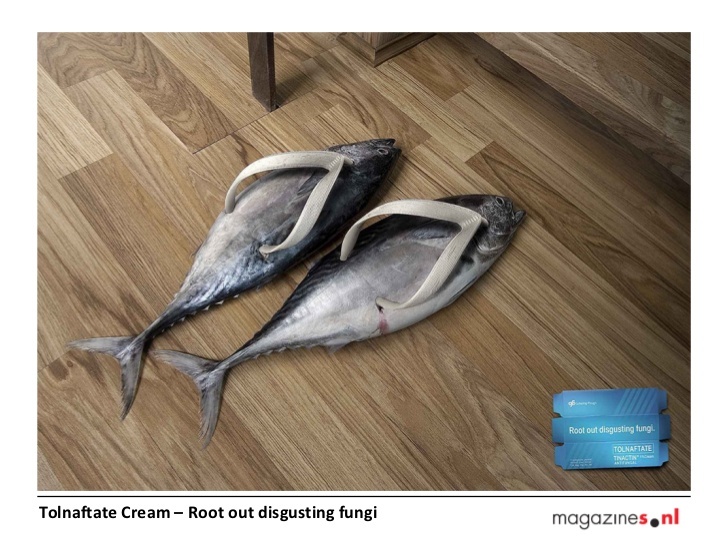 Our second brief was a little more ambitious, and the main focus of the week. On the last full day of the week (Monday) we were all to make a big meal, with us having been put into 4 groups and each group being in charge of one course of the meal serving 17 people. 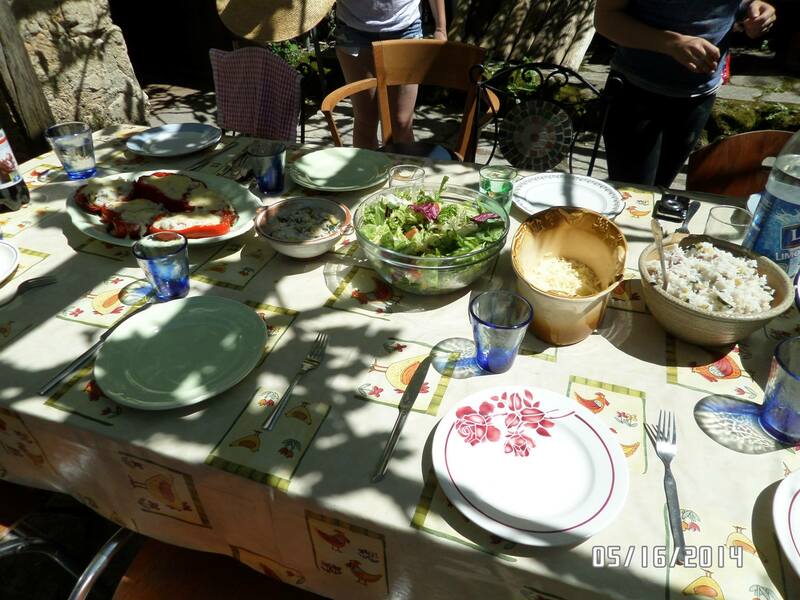 These were the “mise en bouche” (the pre-starter), the starter, the main, and the desert. However, we were not only in charge of making the meal, but also every item of dinnerware needed for that course (excluding cutlery). I was placed in the a group in charge of the starter, which meant that we had to make all the bowls/plates depending on what we were serving, the drinking vessels for the meal, and the candle sticks for the table. We were told that we should give our dinner set a theme, possibly an artistic movement but potentially anything. Myself and my group split off to gather some ideas and do some brainstorming. Our first focus was to try and agree on what it was we would serve. 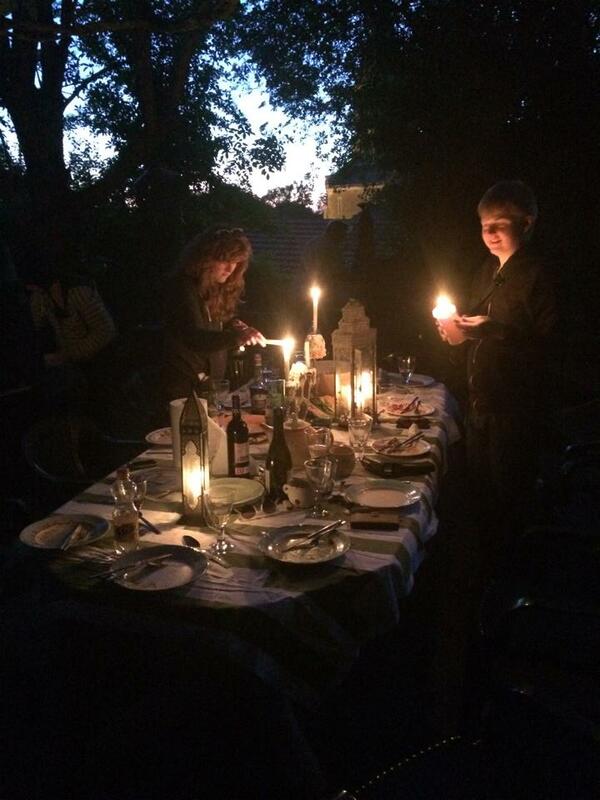 The night before, when we arrived, we had gone to a restaurant in Bordeaux and eaten some very delicious onion soup. This being a classic French dish, and the big meal being served at the end of the week (and so not too close to the night we had already eaten onion soup), it seemed like a good choice. 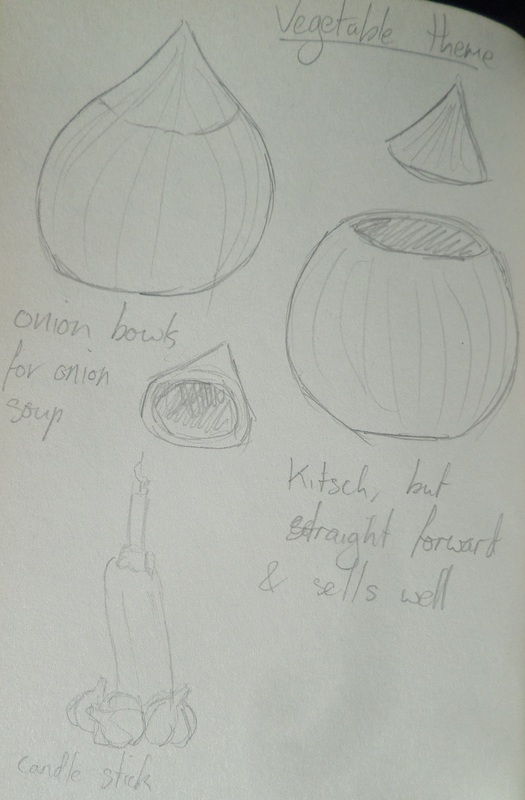 This drew me to the idea of creating an onion shaped bowl, with onions themselves being a nice curved shape, and eating onion soup out of an onion shaped bowl could be quite amusing. 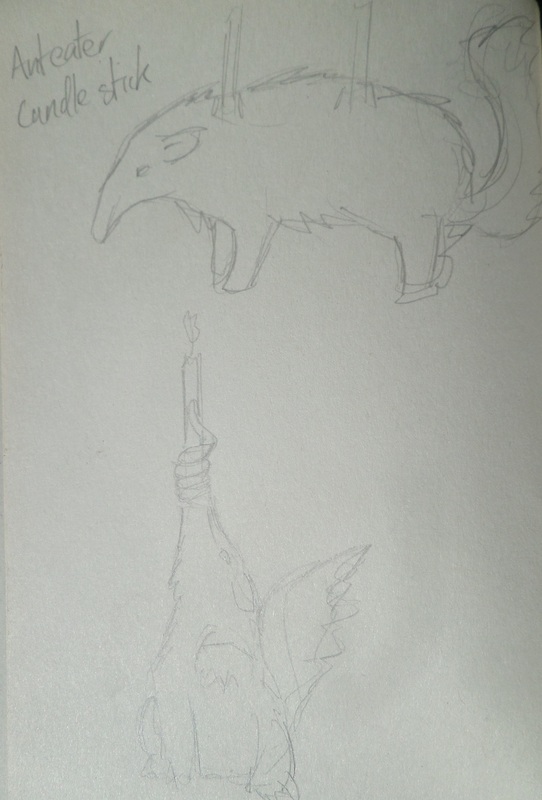 I was very excited by the idea of an anteater candle stick. Not only was it a very fun and novel thought, it was something more sculptural which is my only strength in terms of ceramics. 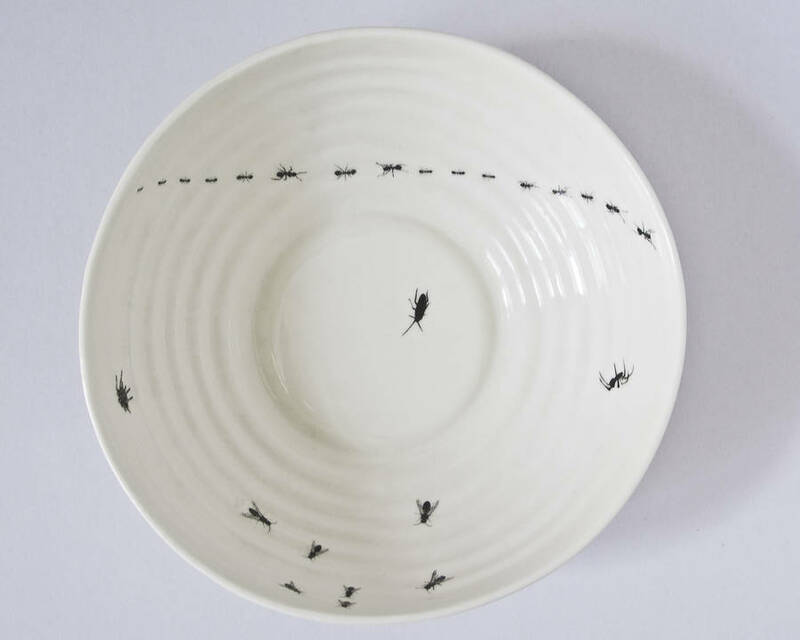 Being in a group of 3 ceramics students and having had no more than a basic amount of experience with ceramics myself, I was very much worried about how much I would be able to contribute to the group, especially when it comes to making tableware which generally involves throwing on a wheel. 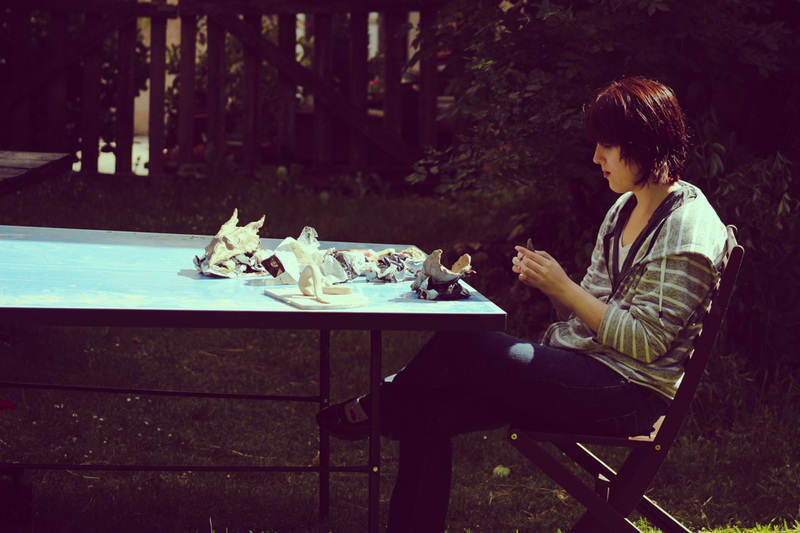 While I am capable of producing something on a wheel, it would be after many failures and certainly not up to the standard that I expected the ceramics students would make with ease. 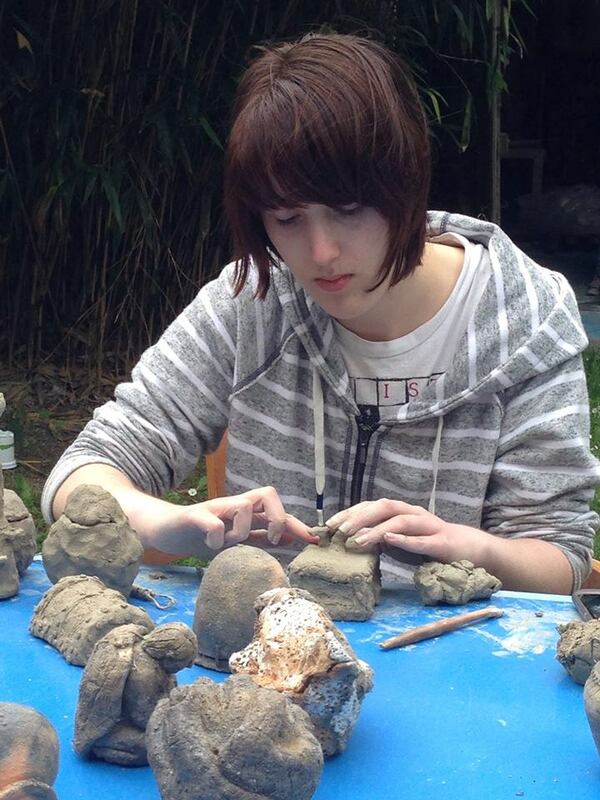 However, I have been told in the past by my tutors as well as Claire Curneen (my favourite living artist who came in to tutor is in sculpting last year) that I have a talent for sculpting and that I should do it more. 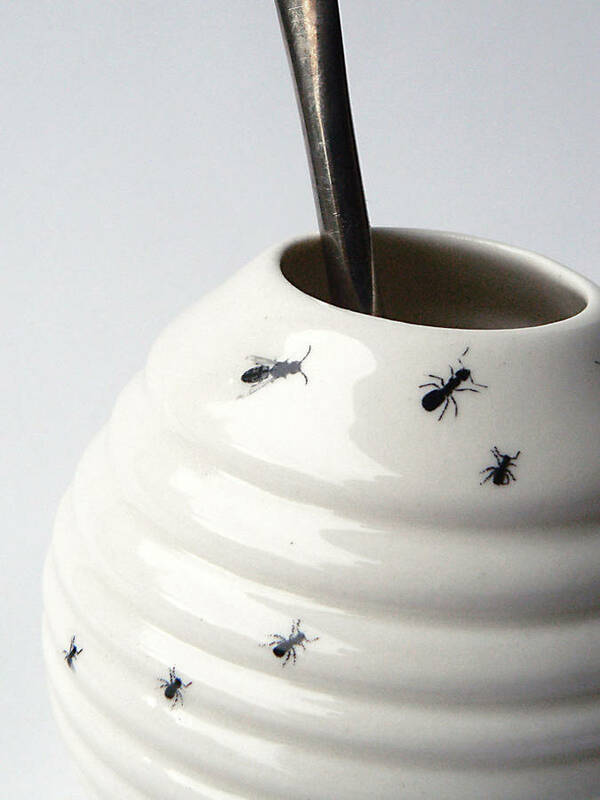 Because of this, I pushed to be put in charge of the ant eater candle stick. I drew some initial sketches, which I was aware aren’t very good representations of an anteater as I didn’t have a reference to look at, and it had been a long time since I’d seen what one looked like. My main idea being an anteater which holds the candle in its tongue, trying to make it as bizarre a situation as possible to be sat in the middle of a table.